A nice deal that Geoff passed along should anyone be in the market to upgrade from internal to external monitors. 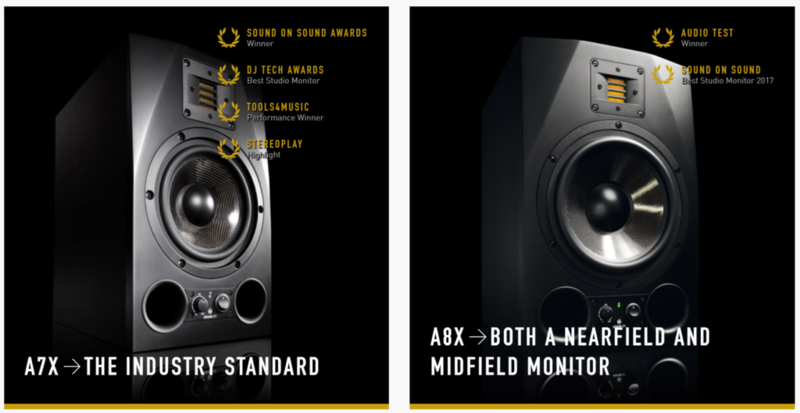 The Adam Audio web site currently has a 10% cashback offer to anyone purchasing a pair of studio monitors from the AX range. Details can be found at www.adam-audio.com/**/cashback. The “**” in the link above should be changed to the letters for your own country. Eg. en for the Uk. The offer is limited to the first 2017 applicants. Can You Load Multiple VST’s? The only time you need to worry about balanced cables is if you develop noise or hum when connecting your speakers to the organ. I am using Electro Voice powered speakers (ELX115P and ELX118P-Sub-Woofer) speakers on the Scala and heard a loud humming sound. You will need to purchase a “Direct Box” to connect between the organ and speakers. I use 1/4″ unbalanced cables to the “Direct Box” and balanced (XLR) cables from the box to the Speakers – No hum and crystal clear sound. Do not go too cheap with organ speakers! I also have a Gala CD organ with Wersi TS7000 speakers (about $2400 (US)) for the kit back in 1990. The best sounding speakers are ones with wooden cabinets not fiberglass, metal or plastic. Also, if you decide to use a sub-woofer, you will need one for each channel. Since the Wersi’s are stereo and any sound can be directed to either left or right, two will be required. The speakers should not be mounted too high (about the height of the organ cabinet or about 5″ above, not much more. The bass and mid-range tones sound warmer when the speakers are closer to the floor. Carpeted floors with good padding also gives warmth to the sound. Speakers mounted high are meant for large venues or club type use to project the sound out to a large audience. I actually went to a pro audio sound dealer that rents sound equipment to bands and rented a complete set of speakers for the weekend before I made the purchase. I decided to buy a complete set of brand new speakers from them so they deducted the rental fee from my invoice. My OAS to OAX upgrade should be done in a few weeks and can’t wait to try the Electro-Voice on the Sonic. My setup is posted on “Owner Studios”. The set of 4 Electro-Voice speakers were about $3000 US. Recently saw comments on speaker cables. Can’t find the discussion now. Should be receiving my oax800 someday (ordered in July. I have powered Wersi tower speakers that I will be connecting to the rear panel of the Sonic on output 2. The speakers are located about three feet to the side of the instrument. Should I use balanced or unbalanced speaker cables and how do you tell the difference? The manual is very clear that the inputs are unbalanced. As for the output’s it only says 2 x Mono Outputs. Far as I know the same is true for the output’s (as in un-balanced). Can some of the folks running external speakers comment? In all the years I’ve been around ( 63 ) I’ve never found the need to use balanced. These as far as I know would only be used if the speakers only had a balanced input or a very long distance involved with lots of interference. Balanced leads have 3 pin connectors ( positive, negative & common ) where un-balanced or normal only have 2 pins ( 1/4 inch jack ). The best speaker system for a home organ / keyboard setup that I’ve ever heard is the ” M J Acoustics ” Minuet 2.1 consisting of 2 passive speakers on stands and a base woofer 300 watt o/p which is claimed as pushing out base as low as 10hz. But the cost of this system which was designed for the Yamaha Tyros is £1800-00. Bill is quite right you must get a speaker that you like, I had and tried several different speakers before I found the one that blew me away. Anybody tried the Yamaha HS8s? They are a top notch speaker, however, whether they suit your preferences or not only you can decide, so go and have a listen to a selection of speakers before deciding. Yes I use Yamaha HS8s with matching sub-woofer and they are a beautiful sounding speaker system. I have them mounted on professionally manufactured spiked stands and they sit at ear level. I am an audiophile – you won’t go wrong with them. Curt posted a photo of my set up on the site a few days ago.